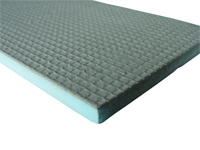 • F-Board is simply glued (using a staggered joint layout) to the concrete or timber floor using typical tile adhesives (non-solvent based) suited to electrically heated floors. • Plaster board jointing tape is recommended for all joints. of the F-Board insulation layer. continues the floor finish/tiling process following normal practices.